I love being a Realtor. There are few feelings better than getting someone into a house they love. (Or… let’s face it… sometimes it’s getting a person out of a house when they need to get out!) Either way, I love my job because I get to help people with this huge financial transaction and that means they (and their families!) are better off than when they started! 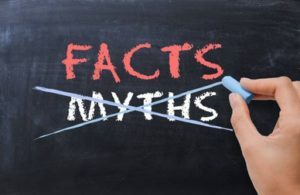 But that’s why I find it so frustrating when home buyers fall victim to what I call “Home Buying Myths”. There are a bunch of them, but over the years I’ve been a Realtor, these are the ones that make my top 5 list because they stop so many people from getting into their dream home. This one might surprise you because looking at houses online can be so much fun! And I have to admit, even before I got my real estate license, I loved it when my mom was shopping for a house! We had a lot of fun looking at listing after listing! But now I know that’s not necessarily where to start. Here’s the problem… You’re browsing around, you find your “perfect” home only to find out you can’t really afford it or that it’s on on a flood plane you didn’t know existed (yes, we have those in Grove City!) or maybe you’re browsing an out of date listing that’s already sold. Talk to a Realtor early on and save yourself a lot of heart ache. My best advice to you (without knowing your personal situation) is almost always to recommend you get pre-approved for a loan. This allows you to jump faster than the next home shopper when you do find your dream home. Plus it saves you from looking at houses that are out of your budget! Okay, a 20% down payment is great because you can avoid private mortgage insurance (PMI). But you can easily find a lender who offers home loans with 10% or even as low as 5% down. Yes, you’ll have to pay the monthly bill for PMI, but it’s not really all that expensive either! Another option is to forget the conventional loan and get an FHA (Federal Housing Administration) loan. That’s a government-backed loan with only 3.5% down, if you qualify. Really, there are a ton of options for down payment assistance. Ugghh! I hate this one! What slimy salesman started this myth?!?!? First of all, the seller might decide they want the buyer (you!) to pay closing costs, which can be anywhere from 3% to 6% of the purchase price. That’s not a deal breaker. I mean I can negotiate for you and see if there’s any wiggle room, but I don’t want you to be surprised when you’re shopping! Plus there are a bunch of taxes and other costs for inspections, credit reports, insurance and a ton of little things (like “filing fees”). But, don’t let this discourage you! Now that you know, you’re already in a better position to buy! Give me a call at 614.395.0400 if you need more specifics for your particular circumstance. Sure, If you’re looking for a conventional loan, having bad credit might not work for you. But, there are options! An FHA loan only requires a 3.5% down payment and borrowers with low credit scores (even under 600) can qualify. FHA loans aren’t for everyone. I’m just saying, you’ve got options! I almost didn’t include this myth in my top five. At first it seems like this is a decision that comes much further into the buying process and not near the beginning, but you really do need to think about this early on. (And I know you know this, but I have to say it… ) You’re paying your mortgage for twice as long as a 15 year mortgage! And that’s a TON more money! Did you hear me? A TON! Let me just ask you this. Image it’s 14 years from now. How would you feel having chosen a 30 year mortgage? Now, I’m not saying the 30-year option is a bad one. But there are other options and part of my job is to take good care of you so I want you to know your options. If you’ve heard something about home buying and you want to double check the facts, give me a call at 614-395-0400 or drop your question in the comments below. Next Next post: Two Years Old!